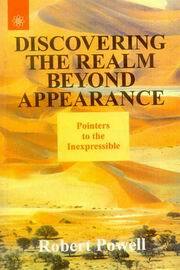 “In Discovering The Realm Beyond Appearance,” Dr. Powell comments elegantly on the insights of Krishnamurti and Sri Nisargadatta Maharaj, and explains his own insights on the nature of the unified state. All those seeking higher levels of awareness will find powerful tools in this book. Drawing upon a rich and diverse stream of religious traditions form Hinduism to Zen Buddhism, Powell argues that the path to spiritual peace and happiness comes through a transformation to the advaitic mode of life. Such a way of life, he explains, is "in tune with what is on every level of one's existence and functioning." The typical Western way of thinking divides mind and body so that the self is disengaged from the living of everyday life, says Powell. Rather, he argues, the fabric of reality is not dualistic by non-dual. In this series of lectures and interviews, Powell offers guidance in seeking the advaitic way of life. For example, he contends that maya, or illusion and changefulness, is simply a stage in our understanding that we go through as we grow toward our full comprehension of non-duality. In his discussion of self-realization and consciousness, Powell ranges over such topics as death, reincarnation, religious beliefs, morality and spirituality. In fluid and accessible prose, Powell opens doors of self-awareness through meditation and other advaitic teachings. Robert Powell has authored numerous books on Advaita and "human consciousness transformation," including, Dialogues on Reality, Discovering the Realm beyond Appearance, and Path without Form. He has edited a trilogy of books on Sri Nisagadatta Maharaj: The Ultimate Medicine, The Nectar of Immortality, and The Experience of Nothingness. He lives in La Jolla, California with his wife, Gina.